Digital certificates are the digital equivalent (i.e. electronic format) of physical or paper certificates. Examples of physical certificates are driver's licenses, passports or membership cards. Certificates serve as identity of an individual for a certain purpose, e.g. a driver's license identifies someone who can legally drive in a particular country. Likewise, a digital certificate can be presented electronically to prove your identity or your right to access information or services on the Internet. Why should I trust a digital certificate's contents? The same reason you trust what is stated in a driver's license: endorsement by the relevant authority (Department of Transport) in the form of a difficult to forge signature or stamp of approval. Digital certificates are endorsed in a similar manner by a trusted authority empowered by law to issue them, appropriately known as the Certifying Authority or CA. The CA is responsible for vetting all applications for digital certificates, and once satisfied, "stamps" its difficult to forge digital signature on all the digital certificates it issues, attesting to their validity. Three uses are outlined here. Your digital certificate could be used to allow you to access membership-based web sites automatically without entering a user name and password. It can allow others to verify your "signed" e-mail or other electronic documents, assuring your intended reader(s) that you are the genuine author of the documents, and that the content has not been corrupted or tampered with in any way. Finally, digital certificates enables others to send private messages to you: anyone else who gets his/her hands on a message meant for you will not be able to read it. How important is the use of digital certificates to me? 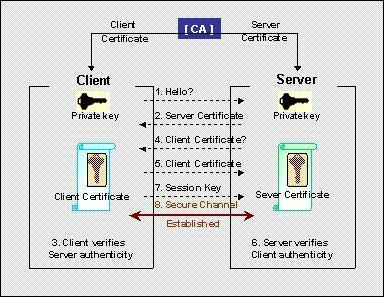 Digital certificates and the CA are just two elements of the Public Key Infrastructure (PKI), an overall Internet security system. Once the PKI is operational, everyone who has a digital certificate can be traced and held accountable for their actions. Consequently, uses for the Internet, which could not be fully realized before, will finally take off: electronic banking and commerce (funds transfer, buying and paying on-line), on-line transactions with government agencies (applying for and renewing ICs, licenses, paying fines and bills), and on-line transactions between businesses. The day when the only way to do some of these transactions is through the Internet may not be too far off. Everyone who wants to be part of it will need digital certificates. What different kinds of digital certificates are there? Digital Certificates can be categorized into Server certificates and Personal certificates. The differences lie in the information they contain and who they identify. Personal certificates serve to identify a person. It follows that the contents of this type of certificate include the full name and personal particulars of an individual. Among other uses of personal certificates some are: Secure e-mail correspondence, and Enhanced access control to sensitive or valuable information. Server certificates identify a server (computer). Hence, instead of a name of a person, server certificates contain the host name e.g. "www.tcs-ca.tcs.co.in". Server certificates are used to ensure that on-line transactions are secure. What do you mean by the Public Key Infrastructure (PKI)? The PKI is the overall system of identifying parties on the Internet using their certificates. It is headed by a Certifying Authority that is responsible for issuing and verifying the validity of the digital certificates. Cryptography is the science of enabling secure communications between a sender and one or more recipients. This is achieved by the sender scrambling a message (with a computer program and a secret key) and leaving the recipient to unscramble the message (with the same computer program and a key, which may or may not be the same as the sender's key). The emphasis of cryptography is on data confidentiality, data integrity, sender authentication, and non-repudiation of origin/data accountability. Physical keys are used for locking and unlocking. In cryptography, the equivalent functions are encryption and decryption. A key in this case is an algorithmic pattern or rule(s) to render the message unreadable. Below is a simple example of how key is used in a symmetric cryptography. In practice the key has to be much more complicated than this. Secret key (symmetric/conventional) cryptography is a system based on the sender and receiver of a message knowing and using the same secret key to encrypt and decrypt their messages. One weakness of this system is that the sender and receiver must trust some communications channel to transmit the secret key to prevent from disclosure. Example: You use a strongbox to send a valuable gift to your friend, locking it with a key. No one can get to the gift without the key, including your friend. Your lock uses a symmetric key: the same key used to lock the box must be used to unlock it. Problem: you must find some method to deliver the key safely to your friend. What is public/asymmetric key cryptography? Public key (asymmetric) cryptography is a system based on pairs of keys called public key and private key. The public key is published while the private key is kept secret with the owner. The need for a sender and a receiver to share a secret key and trust some communications channel is eliminated. This concept was introduced in 1976 by Whitfield Diffie and Martin Hellman. Example: In order to get around the problem introduced in the above example of symmetric key cryptography, a new kind of lock must be created which requires two keys to operate, say A and B. If A is used to lock, B must be used to unlock, and vice versa - this is known as an asymmetric key system. To send a gift to a distant friend, first request your friend's (empty) strongbox, equipped with this new lock and one of his/her keys. We will call this the public key, to differentiate from the other (private) key that never leaves him/her. Put your gift in her box and lock it with his/her public key. Send him/her the box. Only he/she will be able to unlock the box and get the gift. Encryption is the transformation of information from readable form into some unreadable form. Decryption is the reverse of encryption; it's the transformation of encrypted data back into some intelligible form. Data confidentiality refers to a situation in which a message is inaccessible to others except the intended recipient(s). Encryption and decryption ensure confidentiality. If a message received is the same as that which was sent - i.e. it is unaltered during transmission - data integrity is said to have been achieved. This can be verified using a message digest attached to the message, which acts as the digital fingerprint of the message. It's a process to ensure that a message does not originate from someone other than its purported sender. Sender authentication is achieved through two related mechanisms: digital signature and digital certificate. What is non-repudiation of origin/data accountability? Data accountability refers to the availability of proof that message exchange actually took place. The sender would not be able to deny it. This is also accomplished through digital signatures. What is a message digest? Message digest, also known as the hash of a message, is a small piece of data that results from performing a particular mathematical calculation (hashing function) on the message during encryption. Two properties of message digests to note: (i) a small alteration in the original message would cause a big change in the message digest; (ii) derivation of the original message is not possible from the message digest. It acts as a "fingerprint" of the message and is used to ensure data integrity. Just as a handwritten signature is affixed to a printed letter for verification that the letter originated from its purported sender, digital signature performs the same task for an electronic message. 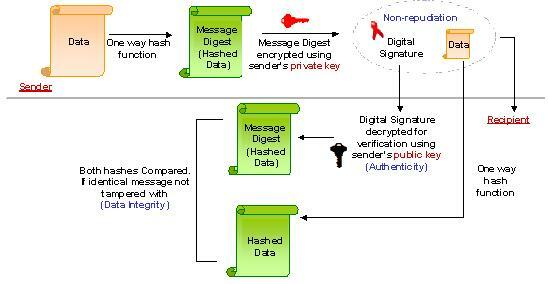 A digital signature is an encrypted version of a message digest, attached together with a message. Public key vs. secret key: which cryptography system is better? A combination of both. The action of encrypting information with public-key cryptography is significantly slower than encrypting with a secret key. However the drawback of the secret-key system is that, secret keys must be transmitted either manually or through a communication channel, and there may be a chance that others can discover the secret keys during transmission. This is not a problem with public-key cryptography, as private keys never need to be transmitted or revealed to anyone. Each user has sole responsibility for protecting his or her private key. So, in practice public-key cryptography is used with secret-key cryptography to get the best of both worlds. A system that uses public-key cryptography first generates a secret key and uses the secret key to encrypt the message. Public-key cryptography key is then used to encrypt the secret key, which then is attached to the secret key-encrypted message. Digital Certificates: Want to know more ? What information do digital certificates contain? What are the functions of a digital certificate? 1. A corporation can grant/deny access to the employees, customers, suppliers and other business partners to sensitive network resources on the corporate intranet by using the digital certificate. 2. A web-based merchant can install the digital certificate to its web server. A customer shopping at this site will be able to verify (authenticate) the identity of the web server and the content provided by the merchant. Without this authentication, the shopper would not be able to trust the merchant with sensitive information like credit card number. A CA is a trusted third party willing to verify the ID of entities and their association with a given key, and later issue certificates attesting to that identity. In the passport analogy, the CA is similar to the Ministry of external affairs, which verifies your identification, creates a recognized and trusted document which certifies who you are, and issues the document to you. A CA can be within the organization itself or outside organization depending on the purpose of the certificates. A company may issue certificates to its employees for reason that only its employees can access to the company database but an internet user might request for a certificate from a well-known and trusted CA in order for him to do on-line transaction securely. How are digital certificates issued? 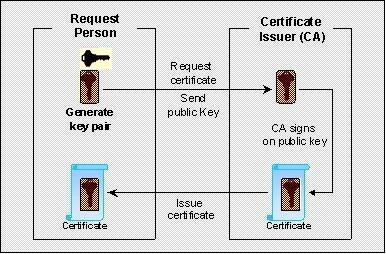 The certificate applicant must generate his/her own key pair and send the public key to the CA with some proof of his/her identification. The CA will put the public key in a new certificate, digitally sign the certificate using its private key and then send the certificate to the applicant. Note: The CA will check the certificate applicant's identification before it generates the certificate and signs the request. Different CAs may issue certificates with varying levels of identification requirements. One CA may insist on seeing the Identity card, another may want a signed letter authorizing certification from anyone requesting a certificate. How do digital certificates work in e-mail correspondence? Suppose Sender wants to send a signed data/message to the recipient. He creates a message digest (which serves as a "digital fingerprint") by using a hash function on the message. Sender then encrypts the data/message digest with his own private key. This encrypted message digest is called a Digital Signature and is attached to sender's original message, resulting in a signed data/message. The sender sends his signed data/message to the recipient. When the recipient receives the signed data/message, he detaches sender's digital signature from the data/message and decrypts the signature with the sender's public key, thus revealing the message digest. The data/message part will have to be re-hashed by the recipient to get the message digest. The recipient then compares this result to the message digest he receives from the sender. If they are exactly equal, the recipient can be confident that the message has come from the sender and has not changed since he signed it. If the message digests are not equal, the message may not have come from the sender of the data/message, or was altered by someone, or was accidentally corrupted after it was signed. How do digital certificates work in a web site? When a certificate is installed in a web server, it allows users to check the server's authenticity (server authentication), ensures that the server is operated by an organization with the right to use the name associated with the server's digital certificate. This safeguard's users from trusting unauthorized sites. A secure web server can control access and check the identity of a client by referring to the client certificate (client authentication), this eliminates the use of password dialogs that restrict access to particular users. The phenomenon that allows the identities of both the server and client to be authenticated through exchange and verification of their digital certificate is called mutual server-client authentication. The technology to ensure mutual server-client authentication is Secure Sockets Layer (SSL) encryption scheme. 1. The user visits a secure web site. 3. The user verifies the server authenticity to ensure that it is an exact site the user is visiting. 4. The server requests a client certificate from the client. 5. The user selects an appropriate certificate to present. 6. The server verifies the client authenticity to ensure that it is an authorized user. 7. When authentication is complete, the client sends the server a session key encrypted using the server's public key. 8. A secure channel is established between the client and server with the following three fundamental security services.